Renay knew exactly what autism was by the time she had her first child, Anthony, because she'd been living with it most of her life. "My brother was diagnosed with autism when he was two and I was 11," she told 9Honey. "It was always my worst fear that one of my children would be born with autism because I saw what happened to my brother." The 36-year-old became very involved in his care, but still failed to recognise the disorder in her own son Anthony, now two-and-a-half. "He had good eye contact, he could play with toys, his sleeping was fine, everything was perfect," she said. When Renay found out her son may have Autism Spectrum Disorder (ASD), it was in the cruelest way. "It was when the nurse was doing his monthly check that it was first mentioned," she told 9Honey. "She was concerned about his diet - he was a chunky baby and is still a solid boy - and towards the end of the meeting we were running through the toys that he liked. "He preferred anything that had a spinning element to it. "Just from that comment we made about the spinning toys, she told us he probably has autism and then started laughing. Renay said she still gets goosebumps every time she remembers that moment. "My husband was in shock and I was too," she recalled. "Just the way she said it, especially without having any formal testing. 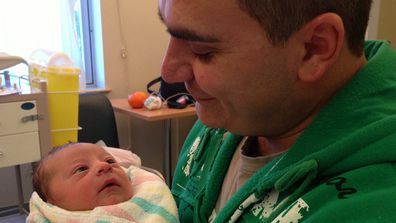 "I was three months pregnant with my daughter at the time." It took an excruciating 18 months for her son to be formally diagnosed with Autism Spectrum Disorder (ASD). 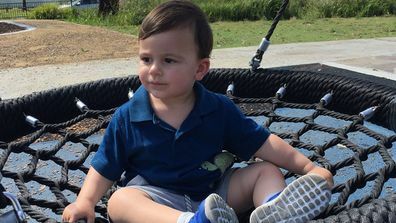 While it took a long time for the nurse's suspicion to be confirmed, Renay told 9Honey it became clear her son was on the spectrum when he hit the 18-month mark. "He really started going backwards," she remembered. "We had him in childcare and we could see the difference between him and other children his age." Renay struggled with the diagnosis. "I went into a really bad depression. I don't even remember enjoying the first few months of my daughter's life. I don't remember any of that. It was only recently that I could talk about it [Anthony's diagnosis] without breaking down." 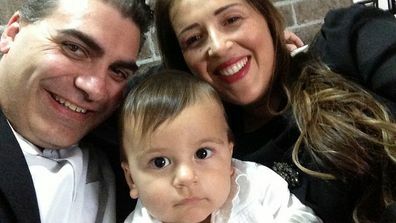 The mother-of-two explained that all areas of their lives were affected by the diagnosis - family interactions, friendships and work commitments and her biggest daily concern is protecting her son from cruelty. "I don't like to involve Anthony with groups of family and friends just in case they look at him strangely or compare him with other kids," she said. "It's really, really, really, really hard." She told 9Honey she and husband Michael only hope that their son learns the life skills to look after himself when they are no longer around to do it for him. "Next year he is old enough to go to kindergarten but we're not sure where he will go yet or what he will need." Renay and autism friends are organising a fundraiser in April to raise money for Autism Awareness Australia. It's called 'Be the Voice', because that's exactly what parents of children with autism become for their precious children. "Autism doesn't have a face," the loving mum explained. "People look at him and say, 'He doesn't look like he has autism'. I just think there's nothing wrong with him. He's just different. He learns things at a different rate. He's really good at some things, but slower at others." While Renay says she finds it hard to care for her son due to a lack of family to help, they have a lot of support from friends they've made through their son's childcare and the professionals they have found to help him. "They're very supportive and very much pro-Anthony," she said. 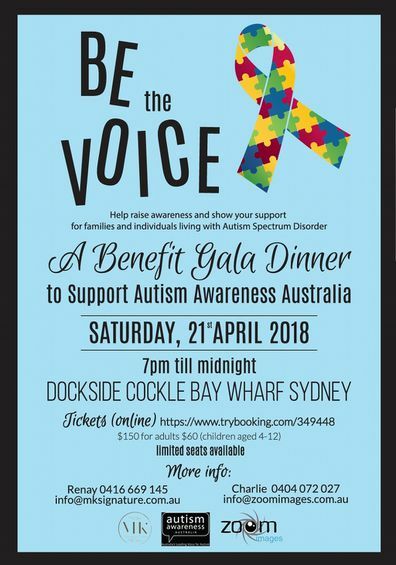 To show your support for families and individuals living with Autism Spectrum Disorder you can purchase tickets to the 'Be the Voice' benefit gala dinner to support Autism Awareness Australia on Saturday 21 April from 7pm at Dockside Cockle Bay Wharf Sydney.